I heard a comic say last night that instead of offering gluten free loaves, she would offer free gluten -- which is actually what I've been doing when I offer bread samples at book talks. And with those samples of free gluten I've found that people have been given permission to enjoy bread at a time when it's so often maligned. Beer and wine have come a long way since the 1970s. It is my hope, and Mr. Fromartz's, that something similar is happening to bread now. May the ragamuffin collection of farmers, millers, bakers, seed savers, home bakers and bread enthusiasts he describes bring about a revolution in how we bake and eat bread. We need to shorten our supply chains and strengthen our regional economies by growing wheat locally. Local wheat might not be white, but it will probably taste better. 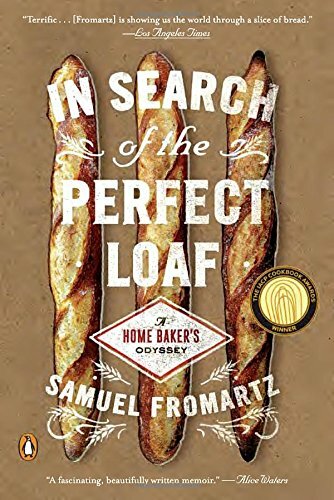 I hope his book leads other people to go on their own search for the perfect loaf (even if it doesn't exist) and to open small-scale bakeries all over the country. It might put me out of business, but that's OK. Long live the revolution. The loaf pictured above, made by Mike Zakowski in Sonoma, California, illustrates this revolution in all its glory. He said this was the first loaf that routinely sold out at the farmers' market, even among his gorgeous baguettes. Einkorn by the way is one of the "founder" grains of the Fertile Crescent, with a history going back 20,000 years. Finally, I gave an extensive interview recently with Portland radio station KBOO, where I discuss some of these "revolutionary" concepts, especially on the value of hand work. (The interview begins at about minute 2:30 into the segment and ends at minute 22.) In our age, that's truly something we've forgotten as a culture.